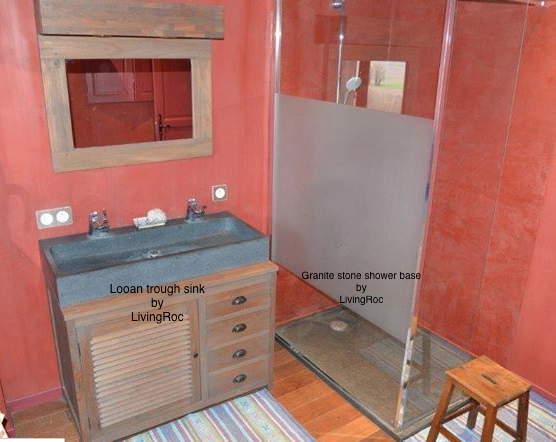 LivingRoc has a wonderful selection of natural trendy stone products for you bathroom remodels. Design your bathroom into an oasis of style, elegance, and tranquility. With classy designs and flowing forms our natural trendy stone products by LivingRoc will complete your project. Have a look into what we can offer you in our bathroom line. From vessel sinks, trough sinks and shower bases. Gray granite double trough sink is a wonderful addition for any bathroom. Aesthetic and practical, Looan trough sink has curved inner sides that allows an easy flow and minimal maintenance. A matching granite shower base is a perfect Duo. Our shower bases are cut from a block of granite that will give you a feeling of beauty and sophistication to your bathroom. 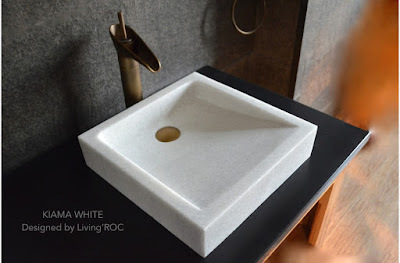 You will find a wide choice of vessel sink made with natural stone products in Marble, Granite, Basalt, and Onyx at LivingRoc. Our basins are made to last and keep their beauty over time. Here is some products to help inspire you into creating a luxurious retreat for your surroundings. Kiama White square crystal marble natural stone bathroom vessel sink made in and carved from a genuine Deco pure white block. A polished finish will bring harmony and serenity into your space. 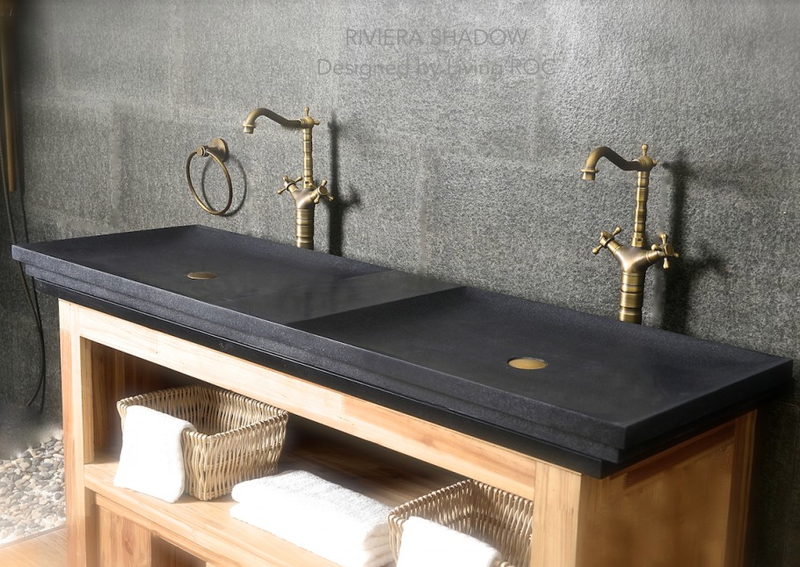 Dune Moon stone sink in our trendy gray basalt that can be used as a vessel or dropin. 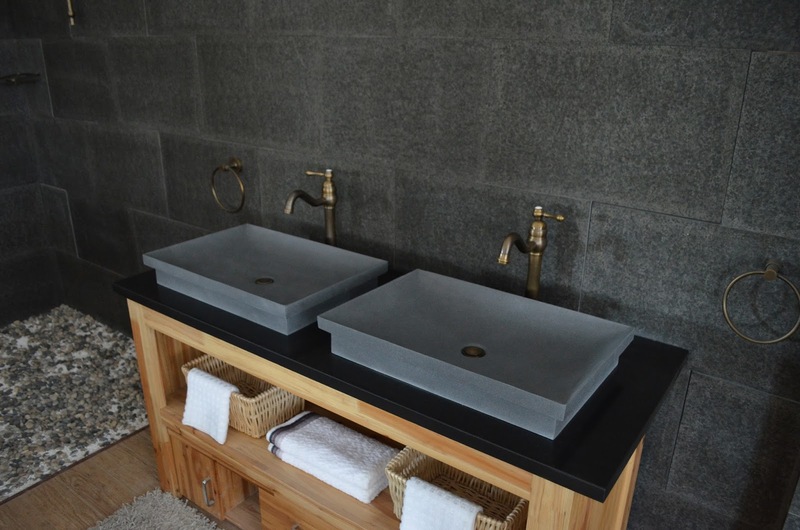 Discover the well-being and restful feeling that gray andesite basalt stone can give you. 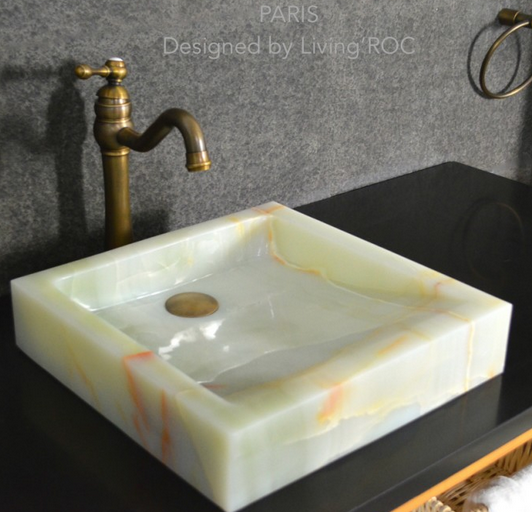 At LivingRoc we have chosen the most beautiful stones that will last for years to come. Could you imagine one day installing a double basin made from pure absolute black granite. Add great value to your home by installing our creation Riviera Shadow, provide a modern, serene, and trendy atmosphere in your bathroom. If you wish to standardize your project, you can choose among a wide range of our natural stone granite and basalt stones. LivingRoc has a variety of sizes and shapes to suit your renovation with a simple install. Made in gray granite natural stone Dalaos shower base will enhance your shower space. Dalaos is extremely resistant to shocks, scratches and daily use. Our shower bases are honed to to give you comfort and security ensuring reliable, non slip products. Made from Mongolia black basalt Coral Black will leave your bathroom looking luxuriously beautiful. This natural stone shower base has a proper slope so the water does not stay in the tray. Our shower bases can be used for indoors or outdoor installations. We welcome you to have a look into what LivingRoc can do to help you transform your surroundings into a natural oasis of luxury.